Houghton Mifflin Harcourt, 9780544809963, 320pp. "The food-pairing bible you never knew you needed." "Do chicken, mushrooms, and strawberries go together? What about banana and chili sauce? In 2012, James Briscione the Director of Culinary Development at the Institute of Culinary Education in New York had the opportunity to work with IBM’s supercomputer Watson. Drawing on a wealth of data, the computer would generate a list of ingredients, often ones you wouldn’t think would go together, for the chefs to make a dish with. The results were surprisingly good. But, as Briscione points out, few people have access to Watson. Briscione took the ideas from his time with the supercomputer and offers a scientific look at how flavors break down and pair up. Using a modified color wheel for foods like brassicas and crustaceans, he reveals unexpected pairings, offering recipes to prove his case." —Food & Wine, "The 18 Spring Cookbooks We're Most Excited About"
"Unlock[s] a whole world of information about why flavors work together...Full of detailed infographics, this book also includes Briscione's original recipes." —Epicurious, "Spring 2018 Cookbook Preview: The 37 New Cookbooks to Buy This Spring"
"A fascinating collection of matrices that break down the best flavor combinations to make main ingredients shine...Visually, this book is stunning, like a science text for foodies, with a particularly helpful introduction...[The Flavor Matrix] is a treat for gourmands and food science geeks." 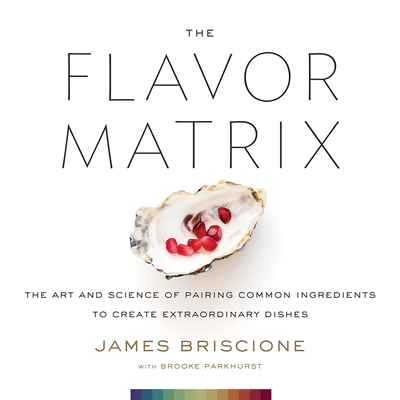 "Briscione, director of culinary research at the Institute of Culinary Education, along with cowriter and wife Parkhurst, will delight food nerds with this scientific exploration of flavor profiles of common ingredients...Professional chefs and home cooks who enjoy experimentation will welcome this insightful new approach." "Flavor pairing is a fundamental building block of what separates the cook from the chef. The Flavor Matrix will help you think like a chef." "This comprehensive book is a great tool for any student looking to strengthen his or her knowledge of ingredients, flavors, and textures. The opportunity to study and understand the science of these elements is a great advantage to today’s generation of cooks. They should all make use of it!" "We may be decades away from unraveling exactly how flavor works, but in the meantime, Briscione has given anyone who cooks an approachable source of vivid inspiration and delightful recipes."